Joining the MacBook Pro, Apple's MacBooks, their best-selling mac ever, also received a complete hardware re-tooling today, with rejuvenated hardware packed inside a brand-new aluminum case, thus putting one of the final stakes in the heart of white and black plastic in the computer line (the original plastic MacBook is still available, at a reduced $999 price) and linking the consumer and pro notebooks under the same design vocabulary for the first time. •Built with the "Brick" manufacturing process that casts the entire notebook's frame from a single piece of aluminum (removing cut-out pieces, rather than bolting on additions), the Air-inspired chassis takes the formerly dorm-roomy vibe of the previous iteration and fully wraps it into Apple's more grown-up polished-aluminum-and-black-glass design philosophy that Mr. Ive has been cranking on of late. •The rumored Nvidia chipset is now in, with a brand new Nvidia 9400M integrated GPU replacing the previous Macbook's Intel integrated graphics. It has 16 parallel graphics cores, pushes 54 Gigaflops and runs up to 5 times faster than Intel Integrated graphics (huge). It's the same card found in the MacBook Pros, but without the secondary Nvidia unit. •The 13.3" LED-backlit screen features the same corner-to-corner glass cover as the MBP. The LED 30% more power efficient. •Like the MBP, the MacBook also meets EPEAT Gold certification for energy and manufacturing green-ness, and has 42% smaller packaging size. •5 hours of stated battery life. •It's a "half-pound lighter" than the previous MacBooks and 0.95 inches thick, and weight is 4.5 lbs. •Also brand new is Apple's next generation glass multitouch trackpad, which eschews a traditional button in favor of making the pad itself the only button. New four-finger multitouch gestures (four!) for exposé and app switching, and multi-button clicks are done via software. •The low-end $1099 model has been dropped (old MBs available now for $999), leaving only the 2.0GHz/160GB/2MB RAM/Superdrive for $1299 and the 2.4 GHz/250GB for $1599-much to the chagrin of those looking for the rumored sub-$1000 NEW notebook. A 128GB SSD is available on the top end, with no price mentioned. •Shipping TODAY, and available in-store tomorrow. It seems like they're hyping the MacBook hard, with a new commercial showing the fabrication process and the powerful new Nvidia graphics. •"In many ways I think it's more beautiful internally than it is externally" - Ive. CUPERTINO, California-October 14, 2008-Apple® today unveiled an all new MacBook® family that redefines notebook design, and at the same time dramatically lowers the entry price for advanced notebook features including all-metal enclosures and pro-performance notebook graphics by $700 to make them far more affordable. The new MacBook and 15-inch MacBook Pro both have a precision unibody enclosure crafted from a single block of aluminum, resulting in thinner, more durable and incredibly beautiful designs. In addition, every member of the new MacBook family includes state of the art NVIDIA graphics, brilliant instant-on LED-backlit displays and new large glass Multi-Touch™ trackpads that offer almost 40 percent more tracking area and support more Multi-Touch gestures. The entire new MacBook family meets stringent Energy Star 4.0, EPEAT Gold and RoHS environmental standards, and leads the industry in the elimination of toxic chemicals by containing no brominated flame retardants, using only PVC-free internal cables and components, and using energy efficient LED-backlit displays that are mercury-free and made with arsenic-free glass. "Apple has invented a whole new way of building notebooks from a single block of aluminum. And, just as important, they are the industry's greenest notebooks," said Steve Jobs, Apple's CEO. "The new MacBooks offer incredible features our users will love -like their stunning all-metal design, great 3D graphics and LED backlit displays-at prices up to $700 less than before." "Traditionally notebooks are made from multiple parts. With the new MacBook, we've replaced all of those parts with just one part-the unibody," said Jonathan Ive, Apple's senior vice president of Industrial Design. "The MacBook's unibody enclosure is made from a single block of aluminum, making the new MacBook fundamentally thinner, stronger and more robust with a fit and finish that we've never even dreamed of before." The new smooth glass Multi-Touch trackpad on the MacBook and 15-inch MacBook Pro gives users almost 40 percent more tracking area than before, making it even easier to use Multi-Touch gestures like pinch, rotate and swipe. New gestures allow users to activate Exposé® or switch between applications at the touch of a fingertip. The entire trackpad surface is also a button, allowing users to both track and click virtually anywhere on the trackpad. Users can easily enable multiple virtual buttons in software, such as right-clicking. The new MacBook delivers the top three features that MacBook customers have told us they want in a new MacBook-an all metal enclosure, high performance 3D graphics and LED-backlit displays-at an entry price that is $700 less than the $1,999 price of the MacBook Pro. At only 0.95-inches thin and weighing just 4.5 pounds, the new 13-inch full featured aluminum MacBook is an incredibly compact and durable notebook starting at just $1,299. Featuring the new NVIDIA GeForce 9400M graphics processor, MacBook delivers outstanding 3D game play on a consumer notebook, with up to five times faster graphics performance than the previous generation. The new MacBook is available in two models: the 2.0 GHz MacBook with a 160GB 5400 rpm hard drive, and the 2.4 GHz MacBook with a 250GB 5400 rpm hard drive and a backlit keyboard. The powerful new 15-inch MacBook Pro at only 0.95-inches thin and weighing just 5.5 pounds offers ultimate performance and extensive expansion features in a remarkably portable design. Starting at $1,999, the MacBook Pro uses the latest Intel Core 2 Duo processors available, running up to 2.8 GHz, and a new graphics architecture that allows users to switch between the NVIDIA GeForce 9400M integrated graphics processor for better battery life and the powerful NVIDIA GeForce 9600M GT discrete graphics processor for higher performance. The new MacBook Pro is available in two models: a 2.4 GHz model with a 250GB 5400 rpm hard drive and a 2.53 GHz model with a 320GB 5400 rpm hard drive. 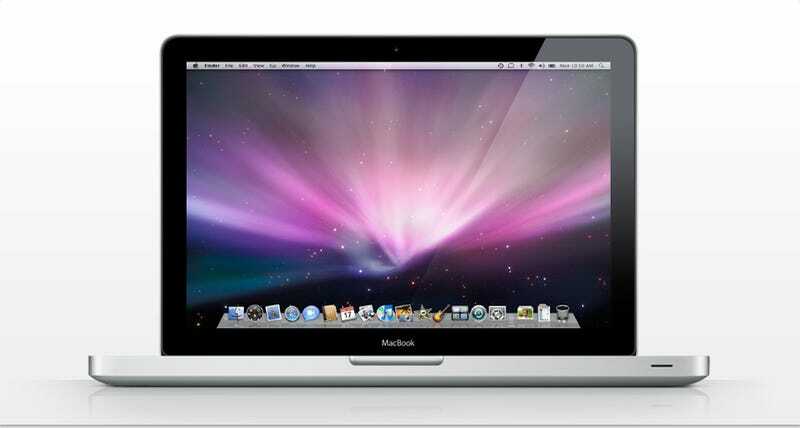 Today Apple also updated MacBook Air and the 17-inch MacBook Pro. MacBook Air, measuring only 0.16-inches at its thinnest point, 0.76-inches at its maximum height and weighing just three pounds, now includes new NVIDIA GeForce 9400M integrated graphics and a faster architecture to provide robust support for 3D games and enhanced performance. Starting at $1,799, MacBook Air is available with a 120GB 4200 rpm hard drive, a 50 percent increase from the previous generation, or a new 128GB solid state drive. The updated 17-inch MacBook Pro keeps its original aluminum design, and now comes standard with a high resolution 1920 x 1200 LED-backlit display and a larger 320GB hard drive or an optional 128GB solid state drive. Setting a new standard for environmentally friendly notebooks, every model of the new MacBook family achieves EPEAT Gold status. * Each MacBook unibody enclosure is made of highly recyclable aluminum and comes standard with energy efficient LED-backlit displays that are mercury-free and made with arsenic-free glass. The new MacBook family meets stringent Energy Star 4.0 requirements, contains no brominated flame retardants and uses internal cables and components that are PVC-free. The new MacBook, 15-inch MacBook Pro and MacBook Air include a next generation, industry-standard Mini DisplayPort to connect with the new Apple LED Cinema Display featuring a 24-inch LED-backlit widescreen display with a built-in iSight® video camera, mic and speakers in an elegant, thin aluminum and glass enclosure. Part of the next-generation DisplayPort industry standard, the new Mini DisplayPort delivers a pure digital signal that can drive up to a 30-inch widescreen display. The Mini DisplayPort is ultra-compact at just 10 percent the size of a full DVI connector, perfect for the sleek design of the new MacBook family. Adapters are available for using the MacBook's Mini DisplayPort with older generation VGA, DVI/HDMI and Dual-Link DVI displays. The new MacBook, 15-inch MacBook Pro and 17-inch MacBook Pro are now shipping and the new MacBook Air will be available in early November through the Apple Store® (www.apple.com), Apple's retail stores and Apple Authorized Resellers. An updated 13-inch white MacBook featuring 2.1 GHz Intel Core 2 Duo processors, a 120GB 5400 rpm hard drive and a slot-load 8X SuperDrive® is now available for $999 (US). * 60 Watt MagSafe Power Adapter. Build-to-order options for the MacBook include the ability to upgrade to 4GB 1066 MHz DDR3 SDRAM, a 250GB 5400 rpm, 320GB 5400 rpm hard drive, a 128GB solid state drive, Mini DisplayPort to DVI Adapter, Mini DisplayPort to Dual-Link DVI Adapter (for 30-inch DVI display), Mini DisplayPort to VGA Adapter, Apple USB Modem, Apple Remote, Apple MagSafe Airline Adapter and the AppleCare® Protection Plan. * 85 Watt MagSafe Power Adapter. * 45 Watt MagSafe Power Adapter. **The MobileMe service is available to persons aged 13 or older. Annual membership fee and internet access required. Terms and conditions apply. ***Time Machine requires an additional hard drive (sold separately). ****Video chatting requires a broadband Internet connection; fees may apply.